In 2011 three elite mountain climbers successfully conquered the 4,000 foot peak known as “The Shark’s Fin.” But it’s the stuff that came before their successful climb that the film spends most of its runtime on. It’s essential to establishing what drives these people to take on this nearly impossible adventure. Over the course of the film, climber and adventurer Conrad Anker tells of his climbing mentor who taught him everything he knows but was killed in a climbing accident. He also tells of his previous climbing partner Alex, a man perfectly suited to climb with him, who was killed during an avalanche. It’s clear what drives Conrad is not only a desire for adventure and loyalty to his friends, but finding some sort of redemption in conquering Earth’s most dangerous peak in honor of those he’s lost. Much of the film was shot by his friends and co-climbers Jimmy Chin and Renan Ozturk. Their first attempt in 2008 left them disappointed, and a separate accident on a mountain left Renan badly injured. Watching what it took for all three of these people to get to their eventual 2011 climb allows for a more heartfelt effort later on in the film. The Shark’s Fin hadn’t been conquered before, it stood as a beacon calling those with an adventurer's spirit. Yet a person can only take so many near death experiences and witness so many deaths before serious doubt enters the mind. 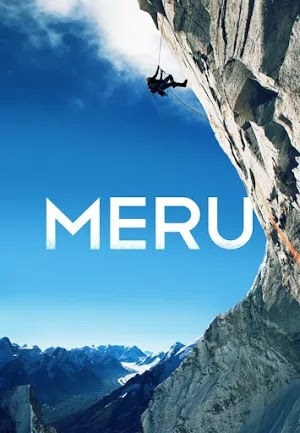 As such “Meru” is as much about the difficulty of the journey as it is the physical, emotional, and psychological toll these adventures have on a person. Yet it is for that toll that they defiantly continue their pursuits. The lives lost to the mountain drive these people to conquer it. This drive grants “Meru” unlikely emotional power in its final moments. It successfully explores the driving force behind this group of mountain climbers better than “Everest” ever cared to. As you might expect the views are stunningly beauty. I only regret not being able to see this on an IMAX screen.